A former military contract division of Zeiss Sport Optics, it remains committed to the military contract business. 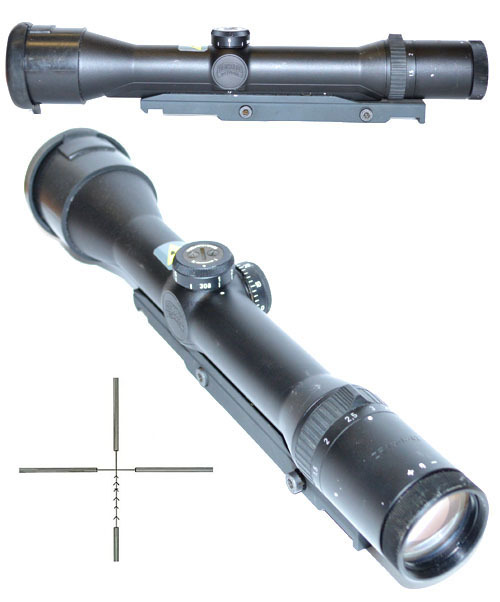 Specially designed for Sniper rifles, it has a trajectory compensation 100m-600m above the adjusting tower. Distances to 1350 m can be covered by this reticle. This scope has an 11mm rail built into the scope body to fit most rifles with this dovetail. Condition: Used excellent. Ref: SC25. Price: £985.00 + £8.00 p&p.